From the Top End through to the Whitsunday Islands. Our recent small group adventure included some of Australia’s highlights, especially when traveling in the winter months. 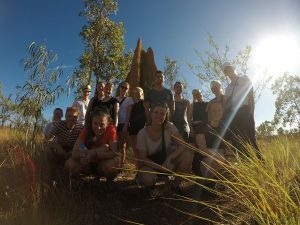 It all started in Darwin with our first group doing our newest adventure tour through Australia. After taking a day to acclimatise to the Aussie sun it was off to Kakadu and Litchfield National Park on a three-day journey into one of Australia’s most beautiful regions! 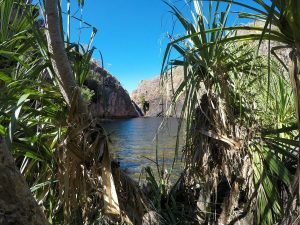 The main focus on our small group adventure was Kakadu. Kakadu National Park is massive and impresses every step of the way. The scenery, the waterfalls and wetlands, the crocs, the abundance of bird life and of course the cultural significance leave you speechless in amazement. The highlights of the trip? There were so many! There are a lot of other great spots to visit in Kakadu, but on our tour we were content with what we saw. The rock art at Ubirr Rock was beautiful and the views from the top of the plateau breathtaking. Our first waterfall experience at Maguk was awesome and then we got to the top of Gunlom Falls – this was the cherry on the cake. The view is spectacular to say the least…and the water super refreshing after a bit of a steep hike up the hill. This spot is a must-see if you are in the region. On our particular trip another highlight also worth mentioning was the camping under the stars in the company of possums and other wildlife… and a cold “frothie” at the Lazy Lizard Pub in Pine Creek. From Darwin it was a short flight to Cairns for a week of adventure packed activities. Cairns is the capital of Tropical North Queensland and the gateway to the Great Barrier Reef. Our group was thoroughly enjoying their active week that naturally included a trip to the Great Barrier Reef and scuba diving with our partner Passions of Paradise. Then there was of course the skydiving, White Water Rafting, bungy jumping and more. Overall a fun week. Our final chapter on our journey was Airlie Beach and the Whitunday Islands. We took a day trip to discover the islands onboard Thundercat, a fast jetboat offering lots of thrills. After cruising out to the islands it was a snorkeling experience with a massive Maori Wrasse called George along with hundreds of other fish. We then moved to another reef for more snorkeling before we made our way to Whitehaven Beach. Whitehaven Beach… it is hard to describe the impression the view of the beach makes on a person. The colors of the water, the smoothness of the silica sand and the pristine setting in general. What a stunning part of the world! The day on Thundercat was fantastic and is highly recommended for anyone traveling to Airlie Beach. On a side note, it is great to see Airlie Beach coming back strong after being battered by Tropical Cyclone Debbie earlier this year. The region will hopefully be back in full swing quickly! Summarising our small group adventure we can say it was practically a perfect tour. We had amazing weather, experienced some of the most beautiful parts of Australia, all in the company of an awesome, positive group of people! Thanks for the memories legends! !